This weekend, rains provided much relief to fire crews working to control the Scenic Loop Complex fires. On Saturday, passing storms did cause two new fires to pop up, but responders were able to put them out quickly. By day 7, two of the seven Scenic Loop Complex fires had been fully contained. 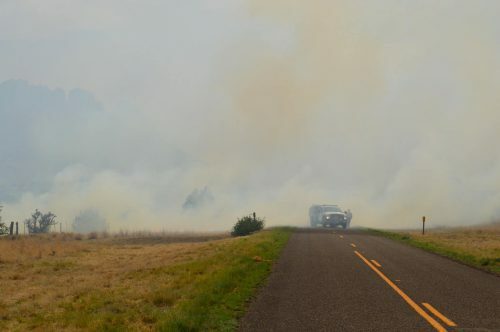 The Scenic Loop Complex fires — which began on June 3 when a lightning storm sparked 18 fires in Jeff Davis County — have blazed for seven days straight and affected more than 24,400 acres. A type 1 incident management team, a federal response group, has taken command of the fire operations, which has seen multiple fire crews and more than 250 responders from across the country. Here’s a complete breakdown of the individual fires’ footprints and their containment (as of Sunday morning). Fire teams Sunday will continue to build lines alone the fires, working to control the remaining fires. Three of the Scenic Loop Complex fires are currently spreading through the Nature Conservancy in the Davis Mountains. The Long X2, 48 Tank Loop and Windmill fires have affected roughly 13,700 acres of the conservancy.